In my local markets, California navel oranges are plentiful, inexpensive, and of excellent quality. In fact, their peak season runs from February through April, so we’re now getting them at their sweetest and most succulent. I’ve been feasting on citrus all winter — peeling and eating it for breakfast, snacks, and desserts. 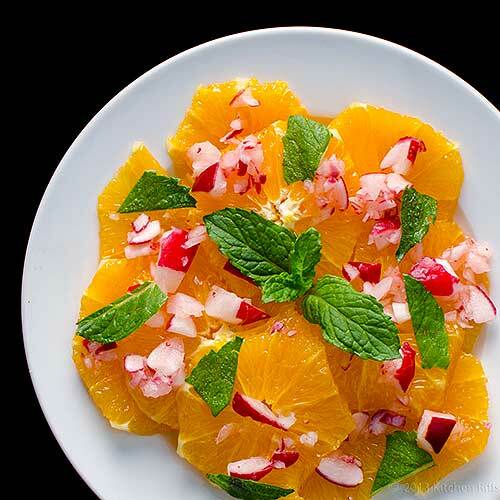 But with warm weather arriving, it’s time to use oranges in salads. 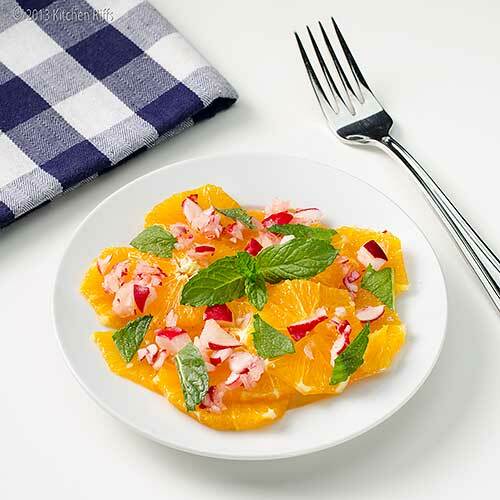 Enter this Moroccan Orange and Radish Salad. 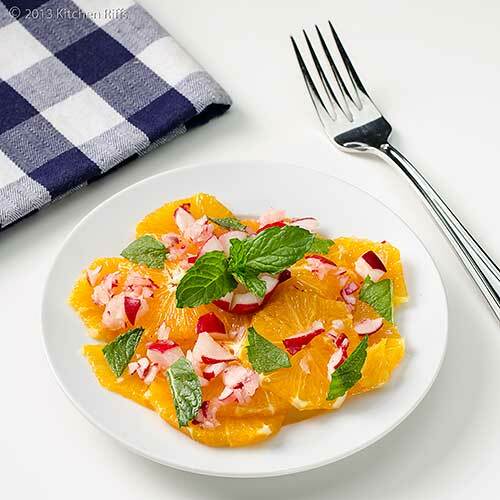 It combines sweet oranges with peppery grated radishes — and then douses everything with aromatic orange blossom water. That may sound a bit odd, but the combination works extraordinarily well. You can serve this dish as either a starter or a side (it goes great with grilled meats or barbecue). And because it’s sweet (with a hint of spice), you could even get away with serving it as a savory dessert. So think of this as three recipes in one. You can’t get any more versatile than that! Years ago — when I was just out of college — I lived in Morocco, and that’s where I first ate this salad. This dish, which is served throughout the country, has countless variations. Moroccan meals traditionally don’t start with the sort of lettuce-based salad that is common in the US. Instead, at the beginning of a meal, the host sets a variety of dishes on the table. The mix typically includes salad-type dishes like this, but also plates of olives or vegetables. And everyone helps himself to a bit of whatever looks good. Once the diners have taken the edge off their hunger, the host generally removes some (but not all) of the dishes. Then the main course — usually a tagine (stew-like dish) that includes some meat or fish — will appear. 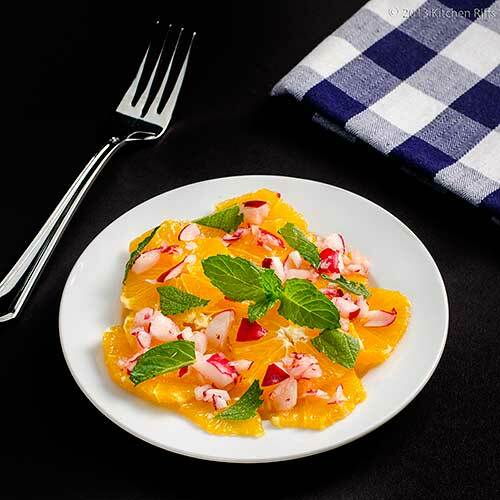 This Orange and Radish Salad is one of the dishes that’s likely to stay on the table throughout the meal, thus serving as both starter and side dish. This recipe calls for an ingredient that many people don’t usually have on hand: orange blossom water (a/k/a orange flower water), which is "a clear, perfumed distillation of fresh bitter-orange blossoms”. Although rarely seen in Western cooking, this ingredient is worth seeking out. It’s available in all Middle-Eastern grocery stores, as well as many specialty markets. It’s also readily available online — just do a search for it. You can make this recipe without orange blossom water (and in Morocco I had it without several times). But the dish is so much better with it — orange blossom water has a wonderful fragrance and flavor. So you really owe it to yourself to track it down. Besides, once you have it on hand, you can add a bit of it to your Homemade Grenadine the next time you make some! My recipe is adapted from Paula Wolfert’s 1973 Couscous and Other Good Foods From Morocco. A couple of years ago, Wolfert updated and expanded the book, retitling it The Food of Morocco. I don’t own the newer version, but I did check it out from the library just to see what it was about. It’s essentially the same book, but with some new information and many new recipes. If you’re looking for a good basic book about traditional Moroccan cooking, there’s no better source that I know of in English. This recipe takes about 20 minutes to prepare, and it benefits from some resting time (no more than half an hour — see Step 2). It will serve 4. Wash and trim the radishes, then grate them coarsely. You can use a box grater for this. But it’s much easier to cut the radishes into quarters and then pulse them briefly in a mini food processor. But don’t overprocess — you want them to retain a chunky texture (so don’t puree). Place the grated radishes in a bowl that is large enough to hold them and (eventually) the oranges. Add the sugar, lemon juice, orange blossom water, salt to taste, and optional cayenne pepper. Toss together. Refrigerate the mixture, letting it marinate for 15 to 30 minutes, until chilled (alternatively, you can proceed immediately to the next step, without chilling). A few minutes before you’re ready to serve the salad, peel the oranges. It’s easiest to do this with a paring knife, removing both the orange skin and the white pith. You can then either section the peeled oranges (you’ll see their natural separations) or cut them into thin discs parallel to the orange’s equator (this is my usual method). Add the oranges to the radish mixture, and toss together. (If there’s any excess juice from cutting up the oranges, I add that to the bowl too.) Garnish with mint leaves or a dusting of cinnamon, and serve. Exact ingredient quantities aren’t critical for this recipe. I sometimes reduce the amount of orange in the dish and increase the quantity of radishes, for example. And I sometimes add black pepper to the dish — it provides a nice note. Although Moroccan food features lots of spices, the dishes are not especially hot. Moroccan cooking does use cayenne pepper, but generally in small amounts (as I do in this dish), so the heat quotient is minimal. Cayenne pepper isn’t typical in this particular dish, but I think it contrasts well with the sweetness of the sugar and oranges. Spearmint is the mint of choice in Moroccan dishes, although most other mint varieties work well too. Peppermint is a nice substitute. Spearmint, BTW, is generally used in Moroccan tea — a sweet and fragrant mixture that’s consumed throughout the country (and something that’s traditionally served to anyone visiting a home). This dish combines well with many Western meals (it goes especially well with flavorful grilled meats or barbecue). I particularly like to make this salad in the spring, when I can get good-quality California navel oranges and early spring radishes. “Well, I’m sure you can fit another Moroccan salad into the mix, can’t you?” Mrs K R inquired. Sweetly. But with that tone every spouse knows. So, um, expect another Moroccan dish — sooner rather than later. Hi Marta, California oranges are excellent - and I say this as someone who used to live in Florida! (Florida has better juice oranges, though.) Thanks for the comment. Talk about a colorful salad...a beautiful addition at the dinner table. This plate sings SPRING IS HERE! Although it's been un-springy here in STL, this salad will bring in sunshine. It actually made me smile just by staring at at these photos. Hi Alyssa, many oranges + radish loving husband = this salad! ;-) Thanks for the comment. Hi Karen, isn't this pretty? As you can see, our spearmint is already flourishing! Thanks for the comment. Hi Malou, the weather here has been crazy the last few weeks, hasn't it? Let's hope the sun shine is finally here! Thanks for the comment. I am dying to visit Morocco! But luckily we have some amazing Moroccan restaurants in Israel and orange salads like this are my favorite. I've also had it with cinnamon and olives, crazy as that sounds. I adore orange blossom water and am always looking for more fun ways to use it. Thanks! Hi Katherine, isn't Moroccan food fun? I actually almost did an orange and olive for the blog! I eventually will, I'm sure. I don't use cinnamon in mine - instead I use a paprika, a bit of cumin, and a touch of cayenne. Good stuff! Thanks for the comment. So simple yet so delicious!!!! I love the look of this salad so much. This refreshing salad would be a wonderful salad before meal. Hi Nami, isn't this nice and easy? And really so nice to eat - very refreshing. Thanks for the comment. The colors in this salad are awesome! So Spring-like! The first thing I saw were the colours my friend, gorgeous! Hi Ashley, isn't this so pretty? And it tastes better than it looks! Thanks for the comment. Hi Uru, I admit I like colorful food! And this dish sure qualifies. ;-) Thanks for the comment. I have orange blossom water in my pantry and I'm making this tribute to Morocco this week. I love citrus salads. This one's a keeper. Hi Charlie, it really is a fun salad. The combo of orange and radish works surprisingly well! Thanks for the comment. Hi Maureen, I think you'll like this - the flavor is familiar yet different. Very tasty. Thanks for the comment. What a refreshing salad! It's just what I'm in the mood for right now after a heavy dinner. It would make a great dessert, too, wouldn't it? Well done, I'm going to have to seek out Orange Blossom Water! What a wonderful colourful dish! I have never used orange blossom water before. By the way, thank you for your lovely comment on Maureen's blog. A beautiful and classic salad. A nice change of pace, too, from the usual tossed mixed greens. Hi Kristy, this really would make a great dessert. If you wanted it sweeter, it's easy enough to add more sugar - I've eaten some quite sweet versions of this (Moroccans tend to like sweet things). Thanks for the comment. Hi Suzanne, that comment on Maureen's blog totally reflects my feelings! And orange blossom water is really interesting stuff - worth playing with. Thanks for the comment. Hi Carolyn, this is a real nice change of pace, isn't it? And this salad truly is a Moroccan classic - and so good it should be! Thanks for the comment. Another delightful salad! And I have a stash of orange flower water that I use in my baklava...so I'm good to go! What a beautiful salad! I love salads like this, no lettuce, but a simple mix of fruit, veggies and herbs. What a great combination of the orange and radish and you know that the touch of heat is a must. This is the second time in a couple of weeks that I've seen orange blossom water - first as an ingredient in Thai tea and now this salad. Now I'm very curious about it as an ingredient. Already found it online! :) Thanks for sharing this delicious salad and yes - I agree with the Mrs - more Moroccan. Hi Liz, you'll really like this salad - super flavor, and really refreshing! Thanks for the comment. Hi MJ, there will be another Moroccan salad next week. ;-) Orange blossom water is really an interesting ingredient - fun to play with. And I suspect you'd like more cayenne in this recipe than I specify. I haven't tried adding dried Hatch chilies to this recipe, but I'll but that would be a wonderful combo. Thanks for the comment. This is an interesting salad. I would have never thought of pairing oranges and radishes. Hi Dawn, I was surprised the first time I ate this, too, that oranges and radishes would be paired together - but it's a great combo! Thanks for the comment. I have made this salad many times thru' the years but I honestly do not think mine has ever looked quite as beautiful as yours: and we DO first and foremost eat with our sense of smell and eyes!! My I honestly suggest that everyone who does enjoy N African cooking should buy Paula Wolfert's wonderful 'The Food of Morocco'. I could simply not cook without it by my side!! Before time pressures made me leave facebook I felt very honoured to belong to her 'Moroccan cooking' foodie group which is probably still alive! What a wealth of knowledge, what a fabulous lady [tho' she takes no prisoners :) !]. Food IS geographical: in Australia we are not served a salad as a first course unless specially ordered. I would serve this as a side with a grilled meat or, since I do not usually pass dessert, as a savoury one :) ! Hi Eha, I have most, though not all, of Paula Wolfert's cookbooks, and they're all good. This definitely would make a good savory dessert! I didn't know that salads aren't common in Australia, but I'm not surprised - they aren't in much of the world (and sometimes in Europe they're served after the main course as a palate refresher). Thanks for your comment. My apologies before I get crucified by our Australian readers: salads are HUGELY COMMON in Australia, but as a main course or a side, or by the cognoscenti, as a palate refresher as you say!! Talk about an eye catching opening photo! I doubt you could have done better, John. It's stunning! I didn't read a word of the post and had already sent the link to a few friends. Now that I've read the entire entry, I'll be sending it to a few more. The Sun is in such short supply around here -- it's thundering overhead right now -- that a bit of sunshine on a plate is just what's needed. Best of all, I've got orange blossom water. Thanks for another great recipe. I cannot wait to give it a try. Navel oranges are plentiful in our markets too and I am loving their color and size too. They are so refreshing when added to any dish. Recently I made some blueberry orange muffins and they were perfect and flavorful. I love them in salads. You salad recipe is very inviting. Thanks for the recipe!! Hi Eha, ah, I see! Thanks for the clarification - in most US restaurants these days although salads are served as starters, there are so many other choices that they've become a bit less popular in that role than they formerly were. And main course salads are also huge here. Hi John, thanks for the kind words! And comment. We've been have rain and thunder too, so on days like this a colorful salad is just the ticket to cheer one up! I hope you enjoy this - it really has an interesting flavor. Hi Natalie, that radish crunch is really fun! And I agree this recipe is perfect for spring. Thanks for the comment. Hi Shibi, isn't it nice to have such abundant and inexpensive citrus? Make me want to figure out new ways of using it. Orange and blueberry combine well, so I'm sure your muffins were heaven! Thanks for the comment. It happens to me as well: once we are headed to a certain cuisine, we stick to it for sometime and forget about the rest. Morroccan food is definitely interesting! I love your citrus salad...looks so tasty and healthy! :) Lovely!! Hi Purabi, I always find it interesting how I get fascinated with a cuisine, and forget about all others! And isn't this salad really nice looking? Tasty, too. ;-) Thanks for the comment. First of all, the colors! How beautiful! Citrus is my favourite fruit and I use oranges in my salads all the time. I love the simplicity and the subtle flavouring of this salad. I also adore orange blossom water and always have it on hand for my ME desserts. I have some very good Moroccan friends here and get treated to some great food and their wonderful customs. Lovely salad John! Hi Nazneen, isn't this a great looking dish? And Moroccan food is so wonderful - you're lucky to have friends that share their cuisine with you! Thanks for the comment. We were in Morocco six years ago, and the food we ate on that trip was some of the best I've ever had. This salad is unusual and lovely, and my search for orange blossom water officially begins now! Stunning salad, John! And i would go easy on orange blossom water. Those are potent! YUM! I was just starting to get a bit tired of oranges but now I've changed my mind. This is stunning and sounds fabulous!! Hi Beth, isn't Morocco a fun place to visit? Wonderful food, lots to see. You definitely need to find some orange blossom water! Thanks for the comment. Hi Kiran, you're right that too much orange blossom water is too much! I don't have a problem in this recipe with a tablespoon, though. Thanks for the comment. Hi Chris, this salad certainly will perk up your interest in oranges again! It really is a nice salad. Thanks for the comment. mmm I love this combination of flavors, and the mint definitely adds a nice touch and creates a beautiful presentation! Well done! This is a stunning salad, John! I'm envious of your time in Morocco. And Paula Wolfert is a gem - I cook out of her Eastern Mediterranean book and love it. I agree with Mrs K R and look forward to another Moroccan recipe! Hi Kristi, it's a wonderful salad! Very light, very flavorful. Thanks for the comment. Hi Hannah, Paula Wolfert is wonderful - I have that cookbook also, and really like it. Thanks for the comment. I love your salad. So pretty and refreshing. :) Gotta love those vibrant colors too. How refreshing this salad looks? I can feel the clean after taste after having a few bites. I never tried orange blossom water. I need to look for it. I don't think I've ever seen Moroccan oranges (or maybe I need to pay better attention to the labels on the grocery stands next time I go the store, right?) Radishes I love and use them in salads all the time! i think i would really like this strong and tangy salad with a simple baked chicken breast that's not too heavy on the spices. Hi Amy, it's a pretty salad, isn't it? And, as you say, really refreshing. Thanks for the comment. Hi Holly, orange blossom water really is an interesting ingredient - loads of recipes for it in Middle Eastern and North African cooking. And this salad really is so refreshing! Thanks for the comment. Hi Julia, with all the California, Florida, and Texas oranges there probably isn't a lot of room in our markets for Moroccan ones (although they're of superb quality) but I have seen clementines from Morocco on occasion. But an orange is an orange - more or less! - so any will do in this salad. And aren't radishes wonderful in salads? One of my favorite ways to use them, too. Thanks for the comment. Hi cakewhiz, this salad would go great with chicken breast! Thanks for the kind words, and comment. Hi Rosa, isn't Moroccan food so nice? And I love colorful, flavorful food like this! Thanks for the comment. Wow, orange and raddish - never seen this combinantion before, could be an intresting taste! I just googled orange flower water. I can see where it would add a lovely flavor to this refreshing salad. The radishes add a nice color and a bit of crunch. Nice salad! Hi Agata, it is a rather unusual combo, isn't it? But it works really well together! Thanks for the comment. Hi Kristi, I think you'd really enjoy this salad - lots of flavor, pretty healthy! How much better can it get? ;-) Thanks for the comment. Beautiful Salad! This is new to me. Never thought of making a salad with Oranges and radishes. Never used orange water before either. I am looking forward to trying this. Now I just need to locate orange water. Great post John! Hi Gomo, isn't this pretty? Oranges and radishes make a really good combo, although I was surprised the first time I saw them together, too. Thanks for the comment. Hi Raymund, I do love that this salad is so vibrant! Look great, tastes better. ;-) Thanks for the comment. I cannot stop staring at this one. I have it saved in a tab so I can keep peeking at it. So cool. And the photos are stunning. Hi Kim, this was a really fun post - I enjoy all of them, but this one was a blast! Thanks for the kind words, and comment. Now this one looks like a keeper. I love radishes and I think the contrast in textures would taste great. And the mint-I love mint. Paula Wolfert's book is beautiful. Checked it our when my son went to Morocco last year. It is gorgeous! Hi Abbe, mint has such great flavor! And Wolfert's books - all of them - are wonderful. Thanks for the comment. Hi John, this is absolutely appetizing, great combination. Love the beautiful orange colour. Thanks for sharing this wonderful recipe. Regards. Hi Amelia, this salad is a real winner. The combo of radishes and oranges is really remarkable. Thanks for the comment. I made this salad; it was sublime! Mint leaves and oranges. It was an eye-opener to me; I've never tried it before and I'm so much impressed! Such a simple recipe and so rich in flavours. Would be a good idea to possibly use a bit of orange blossom honey instead of sugar+orange blossom water? Thank you so much, again! Hi La Torontoise, glad you enjoyed it! It's a wonderful combo of flavors. Alas, I don't think orange blossom honey would be a good substitute for orange blossom water. You can skip the orange blossom water in this recipe, but it really does add a nice note. I know in the US it's easy to find orange blossom water online (Amazon sells it, for example). You might try that. Thanks for the comment. John, thank you so much for your quick response! I arrived in France for vacation and will check the local supermarkets; they are famous for their comprehensive collections of specialty ingredients. Here, it's the asparagus season; everywhere, and in all thinkable colours: white, green and violet... If you appreciate asparagus and have a few quick recipes handy, I would be very much appreciative to read any post or idea that you might be able to share. Hi La Torontoise, I'll bet you can find orange blossom water in a big French supermarket - they've had a long history in North Africa, and there are a lot of Algerian and Moroccan restaurants there, so there's lots of interest in the cuisine. Regarding asparagus, I love roast asparagus. I just saw an interesting past and asparagus recipe today over at Blue Kitchen that looks delish - worth checking out. Copyright © 2010 - 2019, Kitchen Riffs. All Rights Reserved . Powered by Blogger.